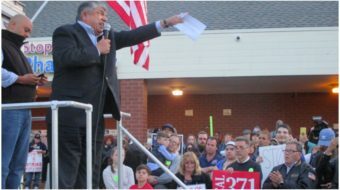 WASHINGTON (PAI)—The nation’s two big teachers’ unions, many of their local affiliates, and the smaller union for school administrators strongly supported the massive gun control campaign which brought hundreds of thousands of people—students, teachers, parents, and supporters—into the streets of Washington on March 24. But a survey of other top unions’ websites shows almost total silence. One exception: National Nurses United, which linked the violence against students and teachers to patient violence against nurses and caregivers. 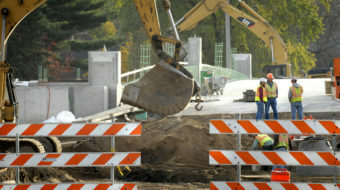 Other unions, including activist ones such as the Steelworkers, Communications Workers, the International Longshore and Warehouse Workers, and the Service Employees, did not post anything. Neither did the AFL-CIO. The March for Our Lives, organized by the students at Marjory Stoneman Douglas High School in Florida, saw historic Pennsylvania Avenue crowded wall-to-wall and almost end-to-end with up to million people Saturday demanding a ban on weapons of war in the nation’s schools, churches, shopping centers, and other public places. They also demanded other strong gun control measures, including raising the purchasing age for weaponry, universal gun registration with background checks, and devices to prevent a single-shot rifle from becoming a repeating rifle. The Douglas students took the lead after the Valentine’s Day massacre of 14 students, two teachers, and the school’s athletic director by Nicholas Cruz, who used his AR-15 to sweep the halls with hundreds of bullets. The two teachers, both American Federation of Teachers (AFT) members, were killed while trying to protect their students. Besides the March 24 march down Pennsylvania Avenue and 800 other allied protests worldwide, students, teachers, and parents walked out of schools for 17 minutes—one minute for each death at Douglas—on March 14. Another walkout is planned for April 20, the 19th anniversary of the first big school massacre, at Columbine High School in Colorado. The National Education Association (NEA), the nation’s largest union, opened its Washington headquarters building to host visiting students from all over the nation. Marchers arrived in D.C. from as far away as Florida, Georgia, and Texas. 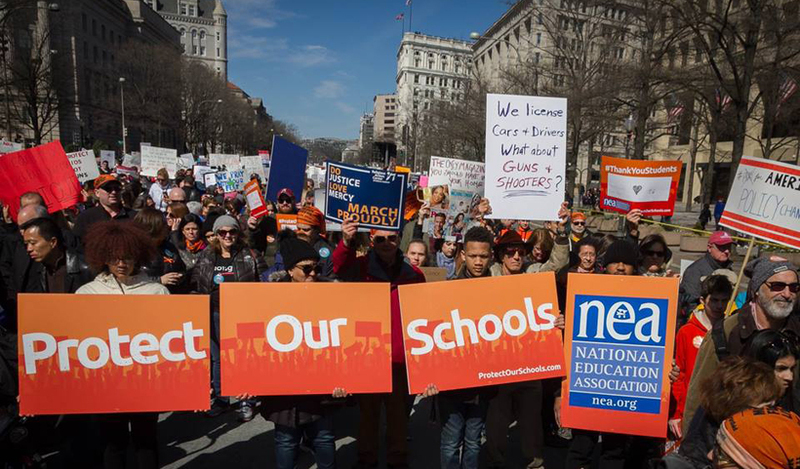 One group NEA hosted came from Connecticut, site of the Sandy Hook Elementary School massacre in Newtown more than five years ago. There, a gunman murdered 20 young children and six teachers—union members—trying to protect them. Several Sandy Hook relatives of the dead spoke in D.C.
“We have to do something with our gun laws, and we have to be vigilant. Talking and talking about it doesn’t change anything, and we need to act. Our kids don’t feel safe,” Mia Dimbo, a middle school math teacher from Bridgeport told the NEA before the D.C. march. Avon, Conn. fourth-grade teacher Laura McDonnell rejected the gun lobby’s—and President Donald Trump’s—favored solution: arming the teachers. The D.C. marchers were also against that, denouncing both politicians who have done nothing due to the heavy weight of the National Rifle Association and the group itself. “We need to listen to each other and use common sense,” McDonnell told NEA. 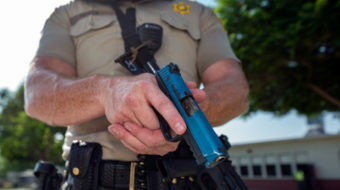 “We don’t need to arm teachers, we need to create more mental health supports and pass commonsense gun laws.” The Connecticut legislature recently enacted tighter gun restrictions. The signs teachers, students, parents, and other adults carried at the D.C. march were almost all hand-made and homemade. “Kids, not guns,” was a frequent chant and sign theme. “The young people leading these movements are challenging generations of passivity and resignation. They are creating hope and unity where there had been despair and polarization. They are confronting us with the moral imperative to solve, not resignedly accept, urgent problems. They are summoning the courage to go up against the lobbies that bullied and bankrolled politicians into submission, and reminding lawmakers they work for us. From this teacher’s standpoint, it’s incredibly inspiring to follow our students’ lead,” said Weingarten, a New York City middle school civics teacher. “We need to have the actual experts on school safety involved in making recommendations and sharing best practices, not a bunch of federal bureaucrats who are new to and unversed in the subject. We also need real dollars put behind hiring mental health professionals at schools to help identify and treat troubled youth who are dangers to themselves and others,” he said. 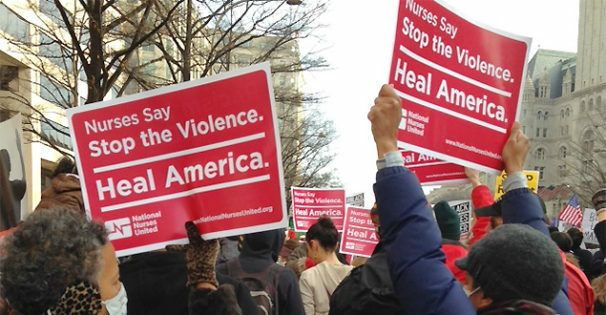 National Nurses United, the exception to the silence from other non-school unions, reminded readers about violence on their jobs, too—including shootings. “In our shared struggle, we see a demand for greater public health and safety,” NNU said, arguing for an anti-violence bill they’re pushing, HR5223.